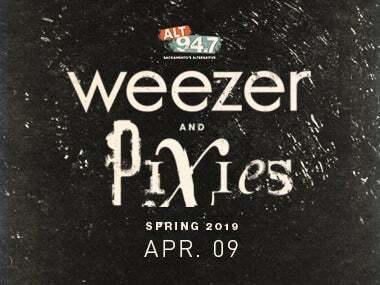 Following a rapturously received summer tour, Weezer will be returning to the road with Pixies this spring for a run of highly anticipated North American arena dates. Produced by Live Nation, the 21-city tour will kick off March 8 in Louisville, KY, make a stop in Sacramento at Golden 1 Center on April 9, before wrapping April 12 in Las Vegas, NV. Tickets will go on sale to the general public beginning Friday, October 19th at 10 a.m. at Golden1Center.com. Also today, Weezer have revealed the first song from their forthcoming, long-anticipated record The Black Album, set for release in 2019 via Crush Music/Atlantic Records. The song -- entitled “Can’t Knock The Hustle” -- was produced by TV On The Radio’s Dave Sitek, with whom the band worked for the first time. The song premiered this morning via iHeartRadio at 5 a.m. PST and follows the band’s smash hit cover of “Africa” by Toto. A video for the song, starring Fall Out Boy’s Pete Wentz as a rideshare driver taking the longest drive of his life, and produced by Jerry Media is also up now. Also, check out HastaLuegoAdios.com for some classic Weezer fun.